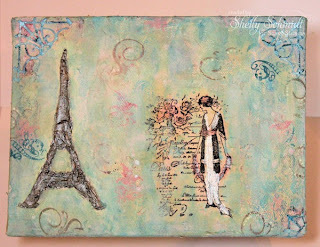 Wow this canvas is to die for! Love your dimension! Jaw-dropping inspiration here!! I am so glad that you took the time and effort to chronicle your work on the canvas! Makes a wonderful tutorial. 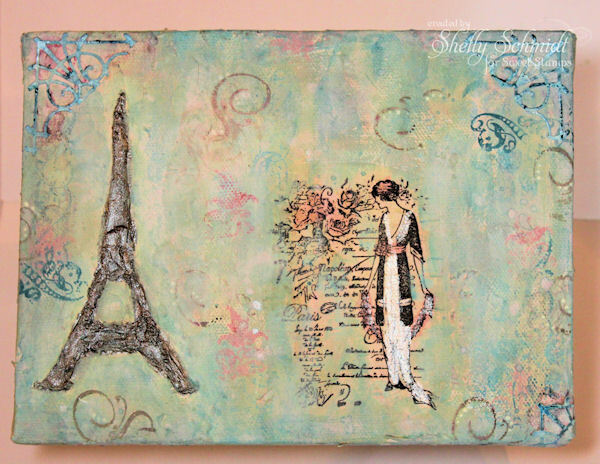 Your ATC and canvas turned our splendidly! Love all the subtle affects of the colors, textures and layers. You are one talented artist!! Congratulations on your work! holy moly! this is beeeeeee utiful!!! wow. sure doesn't look easy, and i'd never do it, but it's gorgeous! This is so great! 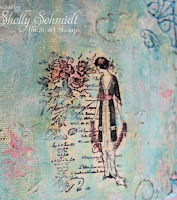 Love the background and the simplicity of the stamp. What an unique card. Love it. 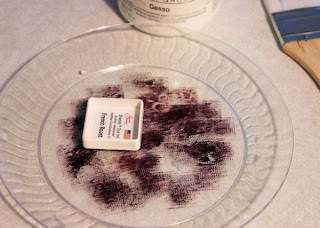 Thanks for joining our Anything Goes Challenge at Created with Love Challenges. Gorgeous canvas! Lovely card! Thanks for joining us this week at Created With Love Challenges for our ANYTHING GOES Challenge! Lovely card and the colors on the ATC is outstanding! Wow, your canvas is so cool. Love the bright background of the atc too. WOW, Shelly -- absolutely stunning! You nailed that background. Gorgeous. Love you stuff especially the ATC love the colors and how it all blends awesome job! Very artsy indeed!!! Love this canvas. SO LOVELY! Wow these are stunning. 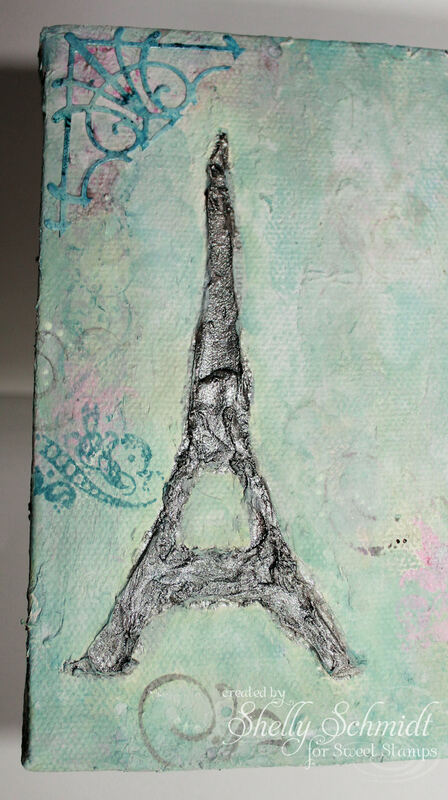 I love the softness of the first card it looks like Parisian painting. The second one is such a contrast with the bright colored background. Two awesome designs!! Ooh-la-la these are FABULOUS!!! 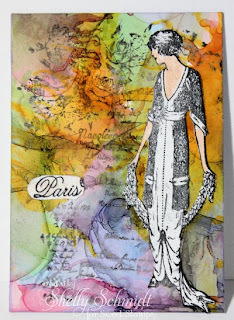 I LOVE the colors on the canvas and the pastel watercolor look you created! The bright alcohol ink colors look great too! 2 different looks and both are awesome! What a great canvas this is. Love your colors and your design. 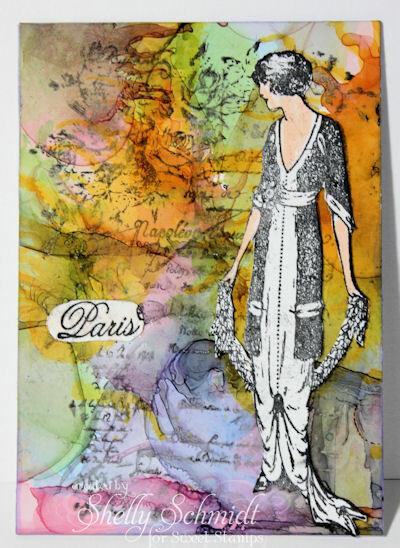 I just got into altered art and love it. thanks so much for joining us this week at Created with Love Challenges. 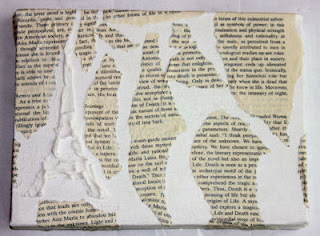 come on over and take a look at the one or two I have on my blog that I did. Thanks for sharing. I absolutely love your canvas!! What a terrific work of art! Great colors!! Beautiful!! Awesome job on the canvas Shelly! Love the colors and images used! Thanks for the tutorial ... well done! What an amazing canvas!! Stunning!! oh my word- totally lvoe this...sooo gorgeous and detailed. Fabulous! 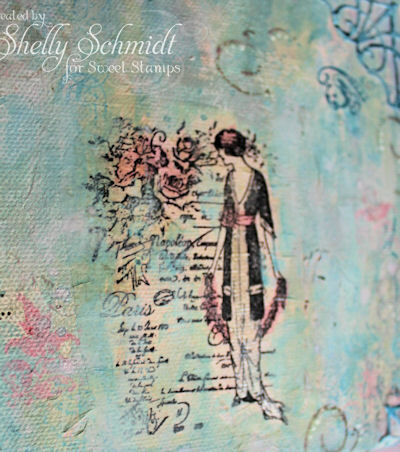 What a beautiful canvas you have created here, Shelly. The colors are lovely and the textures are amazing. 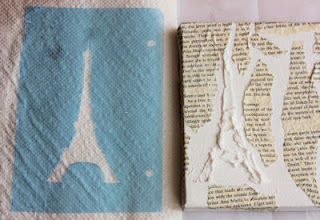 Your Eiffel Tower came out perfect and that is a gorgeous stamp! It is all totally evocative of summer! So happy to have you joining in the fun with us for our Summertime challenge at Frilly and Funkie! Wow!!!!!!!!! This is absolutely stunning! I had no idea you were such an artist. Love seeing how you put it together. You've just blown me away! These are amazing!!! You have done wonderful work this week! LOVE them both so much! So elegant! Thanks for joining us at Created With Love Challenges this week. OMG! Your are truly an artist! I really LOVE your work on the canvas! Beautiful! Amazing! You are so ambitious and creative. Love the colors and how you used the newspaper. Wow. What a fab canvas Shelly! I haven't been by for awhile so was flipping through to see what you have been doing and I came across this gorgeous piece. Wowsa... !